Posted on Monday, March 5th, 2012 at 2:41 pm. Issa Baluch, founder and chairman of Swift Freight International, past president of FIATA and the man credited with pioneering the UAE’s sea-air multimodal transport business, has published his second book: Transport Logistics: The Wheel of Commerce. Co-authored with Charles Edwards, former U.S. president of Cargolifter and executive vice president at Advanced Composite Structures, the publication examines the impact of the 2008 recession and argues that the industry serves as a harbinger of economic cycles. The book also discusses the status of transport logistics planning and preparation in Canada, Chile, India, Singapore, the UAE, Burundi, Ethiopia, Ghana, Kenya, Rwanda and Tanzania. 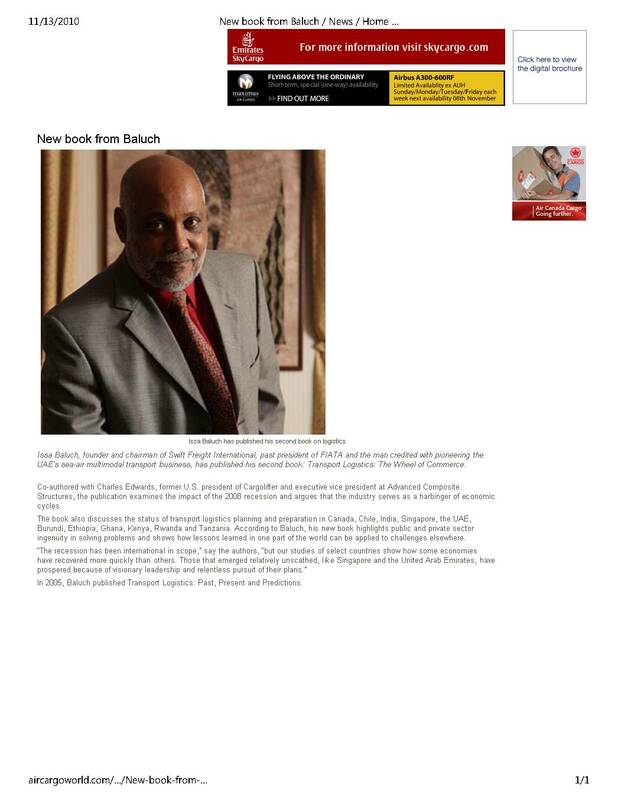 According to Baluch, his new book highlights public and private sector ingenuity in solving problems and shows how lessons learned in one part of the world can be applied to challenges elsewhere. In 2005, Baluch published Transport Logistics: Past, Present and Predictions.